19th Century Egypt provides an interesting place to put a Jonbar hinge, a point of divergence in an alternate history from our own. In our own history, 19th century Egypt made an attempt to embrace the industrial revolution and escape the colonial deprivations that Europeans ravaged on the African continent. And if that wasn’t enough, a religious-focused insurrection led by a figure known as the Mahdi severely threatened British hegemony in the Sudan and the rest of the region. So what if both occurred, thanks to the magic returning? What if the region had a revolution based on the re-discovery of magic, and used it to not only free itself from colonial control, but to start a new revolution of magiktech that made Cairo a leading city in the world and Egypt an envied world power. 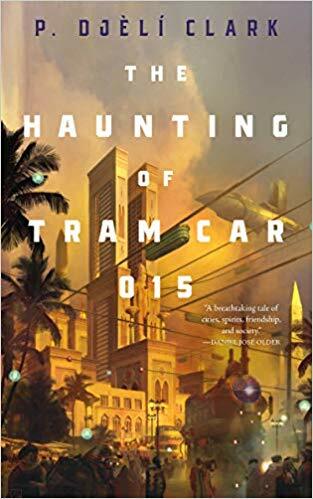 This is the backstory for P Djeli Clark’s “A Dead Djinn in Cairo” and, now, his second story set in that world, The Haunting of Tram Car 015. The new novella vastly expands and re-iterates the world of the previous novella, which is not necessary to read in order to enjoy the latest story, but one can read it online for free. The Haunting of Tram Car 015 takes place in the same alternate Cairo as the previous story and as opposed to Special Investigator Fatma el-Sha’arawi , we get a pair of different investigators from the Ministry of Alchemy, Enchantments and Supernatural Entities. Agent Hamed Nair, paired with new agent Onsi Youssef give us a pair of investigators to bounce off of each other, and I think that this already makes it a narrative stronger than the already rich prior story. Both investigators get called in, just as the title promises, to investigate a haunted tram car. The alternate Cairo of 1912 has a tram network the envy of anyone who has played Mini Metro, especially as they are powered by Djinn. However, not only is the tram car haunted, it is a rather obscure and powerful spirit that lead the investigators to the door of the sheika Nadiyaa. In addition to her importance to the narrative of the main problems of the narrartive, she provides a perspective on yet another change that this alternate Cairo is dealing with: the question of women’s suffrage. Clark seems to be following the theory that technological change and development is a spur to social change, and it is natural that a powerful, technologically advanced Egypt would be a front line for such changes for women. I do think she could have been used a beat or two more than she was, however. The haunting itself and what is really going on and why shows his invention, and the narrative speeds along as the agents and their ally seek to defeat the haunter. The action and adventure beats are richly done, with an excellent eye for action and adventure, just as in The Black God’s Drums. I do think the earlier issues I had with the narrative of that volume have been improved here, I did not feel quite as cheated, especially since this story does end on a more solid conclusion. And also just like his The Black God’s Drums, in a very limited space, the author gives readers a view of a seemingly endless and rich world with ideas and stories everywhere. His alternate Cairo, like his alternate New Orleans, is a place I would love to visit and explore, and with an economy of words, Clark brings us there. In the epilogue of this story, the mission concluded, Hamed gets told a story by a fellow agent of what they have been up to themselves lately.. This is accomplished in a short paragraph of a equally interesting story to the novella we just read that in and of itself could have been an entire novella. 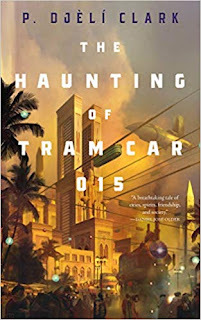 The Haunting of Tram Car 015 is a rich and inventive story, in a world that is designed for many more such stories. I’d be delighted to read them. More, please! Penalties : -1 for the slight underuse of a character who could have been used even more. POSTED BY: Paul Weimer. Ubiquitous in Shadow, but I’m just this guy, you know? @princejvstin.